Due Date: Cria is born! Service Sire: Not currently bred – for $250 downpayment on purchase we can breed her for you. Ish is a beautiful female and clearly is queen of the pasture. First and second shearing histograms are in the 18 micron range. We are expecting great things from this lady. Although, with her penchant for rolling in the nearest open dirt, we use the term “lady” with a bit of roll to our eye. Her paperwork says she is white and a peek into her fleece will confirm that our continuously filthy “lady” is indeed blessed with some fine fleece. in fact, we wrote our farm goals for fleece fineness and Ish meets all of our long-term goals. we are thrilled! Her pedigree reads like a who’s who of alpaca males. Grandsire is PCA Accoyo el Nino – known for passing on mindblowing density! Yes, Ishsha’s dam is a sister to the legendary El Nino’s Michelangelo, currently commanding a $7,500 stud fee. 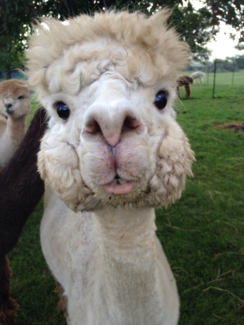 Yes, her sire is HPA Peruvian Don Quixote, 2003 white champion of the Great Western Alpaca Show. In 2016 we took Ishsha to the Rail Splitter Alpaca show, at nearly 8 years of age! She brought home the Blue ribbon! Judges comments included that she had very good fineness and staple length for her age and an excellent bite! Ishsa’s pedigree is loaded with Peruvian Hemingway, Mister Antonio, Pperuvian Caligula, PCA Accoyo El Nino, Pperuvian Timiteo, and Pperuvian Don Juan. Only a very attractive offer can get this girl out of our herd, otherwise you have to wait for her offspring. We are as impatient as you are! Her first cria (WBAF’s Peruvian Smooth Caress), also 16 micron at first shearing, has multiple ribbons including blue in white classes. Her second cria, Luna, produced a 16 micron fleece at first shearing and brought home a BLUE ribbon as at the Railsplitter alpaca show as well as a second at the 2016 AOA National Alpaca show spin-off. Her third cria, Bella, also produced a 16 micron fleece at first shearing and brought home a BLUE at the 2016 Railsplitter alpaca show.